The Pokemon TCG Online is a free to play downloadable MMOTCG version of the Pokémon Trading Card Game, where players can test their skills in solo modes or in multiplayer modes against each other. They can form powerful decks by collecting cards through various methods and reward systems. The game offers a great experience for both experienced players and rookies. It starts out with a tutorial where all the game basic mechanics are demonstrated, in a simple and effective way, while also giving the more experienced players the ability to bypass the tutorial by disabling the "New User Experience" option. Pokémon Trading Card Game Online (Pokémon TCGO) features many fun mechanics and event systems, while featuring cards from the most recent Pokémon generations. The game receives several updates on a yearly basis, introducing new features and cards. At the start of the battle, a coin will be flipped and the player that guesses the right side of the coin decides who plays first. Both player's Decks are then shuffled and both of them draw 7 cards. If a player has a Basic Pokémon in their Hand, they'll put it facedown as their Active Pokémon, with the ability to put the other Basic Pokémon they have facedown too, on the Bench Area. Each player then puts the top 6 cards of their decks as Prize Cards, that an enemy can acquire after defeating their Pokémon. 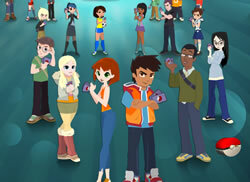 Players then flip their Active Pokémon face up and the battle starts. Each turn has 3 basic phases they are, the Draw Phase, the Action Phase and the Attack Phase. Draw Phase: During the draw phase, the players draw a card from their deck. If a player is out of cards during this phase and have no cards to draw, they automatically lose. 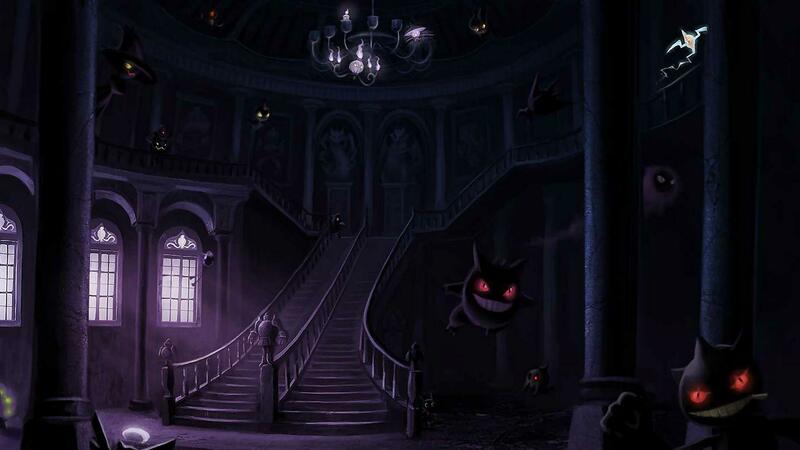 - Replacing the Active Pokémon (Only one Pokémon can retreat during a turn). - Put an Energy on a Pokémon (Only one per turn). - Placing Pokémon Cards on the Bench. - Play Trainer Cards (Item Cards can be used several times per turn, while Stadium and Supporter Cards can only be used once). Attack Phase: During this phase the player picks what attack their Pokémon will use, to inflict damage to the enemy Pokémon. After the attack, they end their Turn and the enemy Players gets theirs. There are 3 Card Types in game, Pokémon Cards, Energy Cards and Trainer Cards. Pokémon Cards: They mainly contain Basic Pokémon, Stage 1 Pokémon and Stage 2 Pokémon Cards. The Cards from Stage 1 and 2 are Evolution Cards, featuring Pokémon with the ability to evolve into stronger and more powerful ones. Energy Cards: In order that a Pokémon attacks, the player needs first to put Energy Cards on them, matching the energy types displayed on the Pokémon's attack move. For example, to use the Flamethrower attack, available on some Fire Pokémon and requiring 2 Fire Energies and 1 Colorless Energy, the player may use 3 Fire Energies, 2 Fire Energy and 1 Colorless Energy or 2 Fire Energy and 1 Energy from any other element as Water or Grass, since the Colorless Energies can be replaced by any element. There are 11 Energy Types, each having attacks with unique features. Psychic Psychic-Type attacks may inflict harmful status effects on opponents including Poison, Sleep and Confusion. Trainer Cards: These fall under three subcategories, Supporter Cards, Stadium Cards and Items Cards. Supporter Cards allow the player to trigger an action such as card draw. Stadium Cards, are cards that affect the Pokémon on the battlefield, with different effects, such as healing a specific type of Pokémon. As for Item Cards, they also trigger several effects, like healing a Pokémon or removing a harmful status from them. Defeat all the Pokémon the enemy Player has. Make the enemy player run out of cards. Earn all the Prize Cards of the enemy player. There are 6 Prize Cards in total, on each side. One to Two Prize Cards can be earned after defeating an Enemy Pokémon. Non-Exclusive Theme Decks: They are decks from the Black & White expansion and can only unlocked through redeeming special codes in game and the player may only have one copy of them, per account, while it is possible to have several copies of other Theme Decks. Online-Exclusive Theme Decks: These decks include the XY Basic Blue, Green and Red decks, which are unlocked by defeating 7 Trainers in the Trainer Challenge Mode. 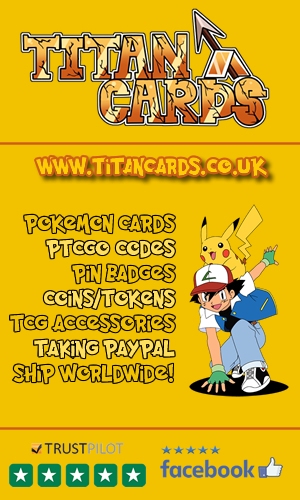 The XY Basic Yellow Theme deck is unlocked once the final Tutorials are complete. Few Decks, which belong to this category, cannot be used in Trainer Challenge Mode like the Mental Might Deck and the Rallying Cry one. Rotated Online-Exclusive Theme Decks: These Decks include the old classic Basic Blue, Green, Red, Yellow and Orange, the BW Basic Blue, Green and Red, and the Power Relay Deck. Most of these are no longer obtainable but they can still be used by the players who already have them. Additional preset / theme decks can be purchased using ingame currency from the in-game shop. These Decks can contain only the authorized cards used in the official plays and events of Standard Format. As many expansions are released each year, many new cards get rotated in and out of the allowed cards list, and consequently the Standard Decks. The Expanded Decks sub-type is similar to the Standard Decks, with a wider range of authorized cards that can be used in the Expanded Format. Several new cards get added to the Expanded Decks' usable cards list, as many others get banned. As its name suggests this sub-type, that was removed in March 2016, would allow the use of all the cards in game, creating devastating and over powered Decks. Only Decks from Black and White, along with HeartGold and SoulSilver, can be used in this play type. Since HeartGold and SoulSilver cards may create very powerful and unbalanced Decks, if combined with the right cards from the other expansions, this play type was introduced to counter that, while allowing players to still enjoy using the cards from the HG and SS expansion. It's a solo mode where players can only use Theme Decks, to battle different AI controlled Trainers. 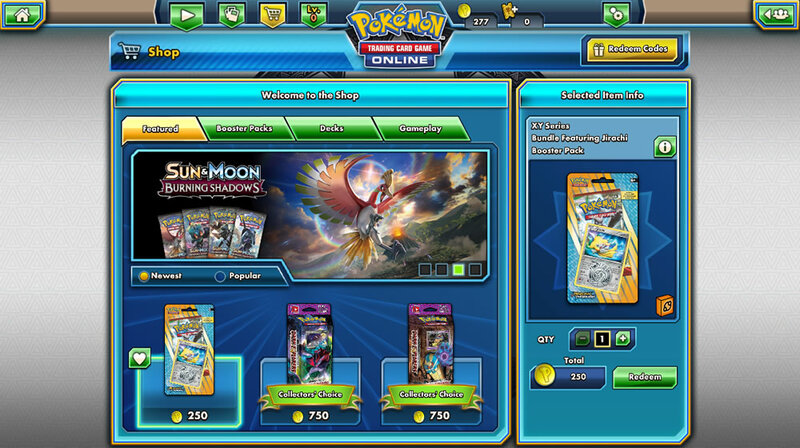 The Theme Decks that can be used include the basic free ones, those bought by the player from the Shop and the Theme Decks unlocked through Tutorials. There are mainly three Leagues, within the Trainer Challenge mode : The Gold League, the Platinum League and the City Championship. The Player will start out in the Gold League, where they have to defeat all the 12 Trainers, in order to advance to the Platinum League. Moving up to the City Championship, will require repeating the same process with the Platinum League. Since the Leagues function within a ladder system, the player will unlock a new Trainer to battle once at a time, as they can only be accessed after the player defeats the available one preceding them. Unlike other games, no penalties are applied when the player loses against one of the AI and they even get, while scoring a win on the other hand, is very rewarding. Each time the player defeats an opponent, they will earn Trainer Challenge Points with that specific one. Earning enough points by battling the same Trainer many times, will unlock a star under the Trainer's picture. Up to 4 stars can be gained for each trainer, with every star unlocking rewards that increase in value, as the number of stars increases. The rewards can be earned only once per Trainer. One must note that losing against one of the AI does also grant a very small amount of points, but it's irrelevant compared to the amount gained through winning. This amount whether be it a win or a loss, is affected by the difficulty set for the league, which the player can alter from "Easy" to "Medium" or to "Hard". The harder the difficulty is set, the more points the player can earn. The Easy setting will keep the points earned as they are. The Medium setting will multiply all the points earned by two, while the Hard setting will multiply them by three. It is a multiplayer mode, where the player will face another random online player, after selecting a play type from the four Deck Formats. Whether they win or lose, both players will earn 1 Trainer Token and a free Bonus Wheel Spin. If the player wins against another, who had more advantages over them(the advantage is determined by the game, as being a more experienced player with a lot of matches played), they'll earn 2 extra Trainer Tokens. Moreover, scoring a win will earn the player 10 Versus Points, and an extra 5 points if they win against a player who had the advantage. Winning several consecutive games will trigger the streak rewards. If the player loses, they'll earn 1 Versus Point for each prize card they earned during the duel. The Versus Pont will be added to the player's points in the Versus Ladder. Within the course of 21 days, the players have to earn as much Versus Points as they can, since these points unlock many valuable prices and advance them further on the Versus Ladder, which will reset after the 21 have passed, resetting the rewards all along. Also referred to as "Event Mode", it is a player versus player mode, where players face each other in an 8 man elimination Tournaments using Theme, Standard, Expanded or Legacy Decks. 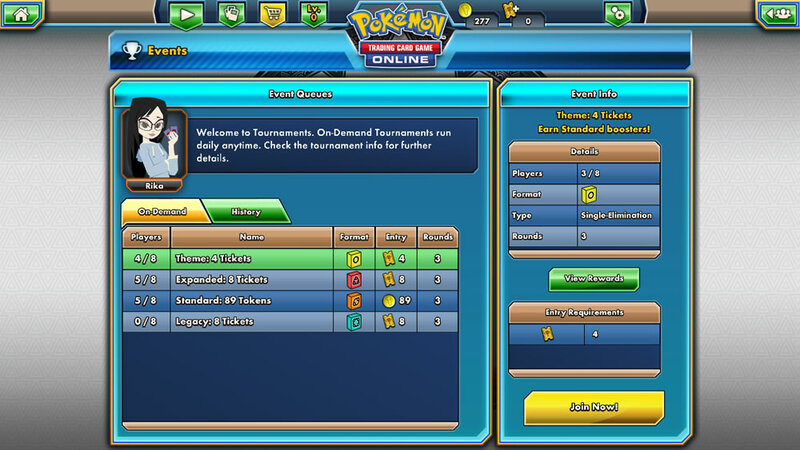 To join a Tournament queue, the player has to pay either 89 Trainer Tokens, or 4, 6, 8 or 24 Event Ticket, depending on the Tournament. Once the player joins a queue, they have to wait till 8 players have joined, then, the Tournament battles will start. If the player wins the first battle, they can advance to the semi-finals and then to the finals. Afterwards, and once the Tournament is over, they'll receive certain rewards, depending on their progress within the Tournament and the currency they used to participate (Trainer Tokens or Event Tickets). Usually, one of the Tournaments will be using a specific Deck Formats and will need the players to pay in Trainer Tokens, while there will be three other Tournaments for each of the other Deck Types, which require an Event Ticket entrance fee. Which Deck Format requires which currency is changed every week. During the week, the Event Ticket fee for the Tournaments will be either 4 or 8. But during the week-end, the possibility to pay 6 and 24 tickets gets unlocked, along with the special Tournaments. 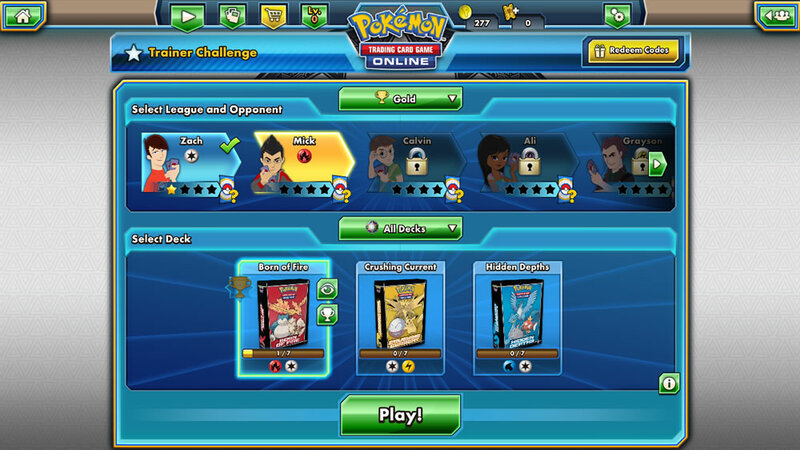 Within the Quick Match Mode, players will be using random Theme Decks to face random online players. This mode doesn't affect the player's progress in other modes or any gameplay features. Many Tutorials are presented here, offering the player all the guidance needed and teaching them the game mechanics and features. 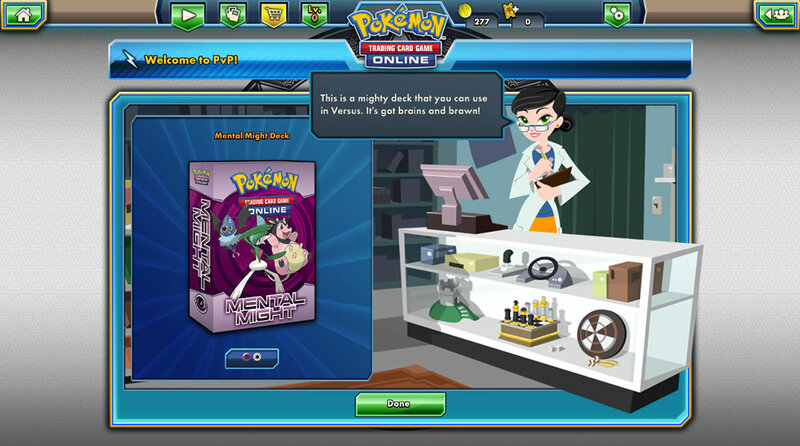 As the game starts, the player is automatically put through a tutorial within the Trainer Challenge Mode, (which can be bypassed through the option menu, as previously stated) where they will be welcomed by Professor Holly in a Game Store, decorated with bookshelves and various items. Professor Holly will teach the player the game mechanics, by making them face several opponents consequently. The opponents are as follow : Zach, Ella, Calvin, Ali and Otis. Defeating Otis, will grant the player a special card along with a booster pack. Additionally, if the player logs in using their Pokémon Trainer Club account, they'll be presented with five new additional tutorials after defeating, Zach and Ella. These tutorials will teach the player about Special Conditions like Paralysis or Poison, instead of the beginner game mechanics. They will also reward the player with 25 Trainer Token per tutorial complete, and a final reward of 1 non tradable card and 1 10-Card Booster Pack, once all the tutorials are complete. This mode allows players to battle players from their friend list, by tapping the head icon next to their friend's name in the list, which will issue a challenge request. This mode has no effect on other gameplay features. 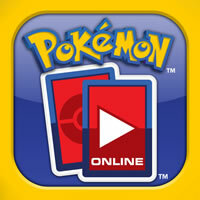 It allows the player to pick any Deck they want and test it out against one of the AI trainers from Trainer Challenge. This of course, will have no effect on the player's progress in the Trainer Challenge Mode, nor any other mode. These challenges are like quests that require the player to complete a certain task, and they come under the form of Daily Challenges and Special Challenges. 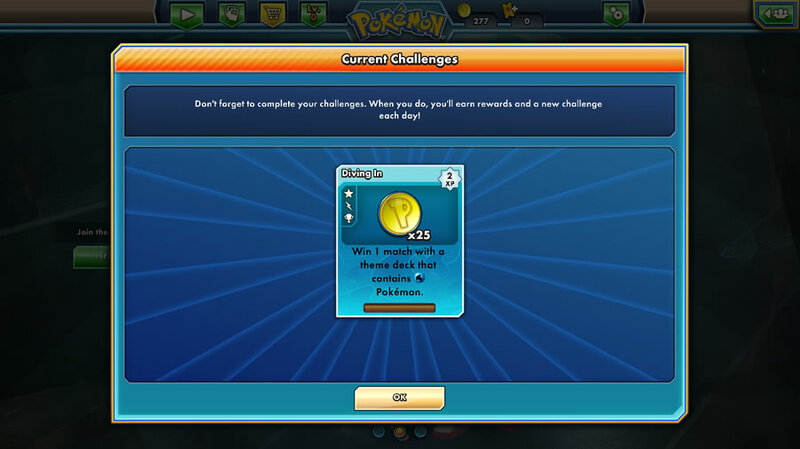 Each Challenge is related to a Pokémon-Type and completing Challenges will earn the player Experience Points in their respective Pokémon-Type. The acquired experience helps the player advance in the Pokémon-Type Level, with each level unlocking a specific feature. To reach level 1 which unlocks Pokémon-Type themed Coins, the player needs 5 exp points. Level 2 requires 10 exp points and unlocks Card Sleeves. As for the level 3, which is the final level for the Pokémon-Types, it requires 20 exp points and unlocks Deck Boxes. Each time the player levels up in a Pokémon-Type they gain 1 level in their own Player's Level. As the Player's Level increases, they'll be able to choose between up to 3 three Challenges daily, but they can only select one. They'll also be able to store up to 3 Challenges, at high levels, as the opposite of a low level player who can only have one challenge a day and will acquire a new one, only if they complete or abandon that one challenge. One should note that the four first Challenges the player gets, as they start playing, cannot be abandoned, and must be completed. Furthermore, some Challenges are rarer than others, with lower chances of popping out when the player logs in, and the rare the Challenge, the better the reward. When you log in you'll be presented with a dialog like this one letting you know what daily challenge you've been assigned + the rewards and XP. As for the Player's Rank, it is mainly used to calculate how much experience the player has, based on their Decks and their Win Ratio. This feature is mainly used, to match up players with similar stats against each others. Sometimes players with more experience get matched against less experienced players, granting them the "Advantage" status, which we mentioned before. If the less experienced players score a win against the "Advantaged" players, they'll receive bonus rewards. 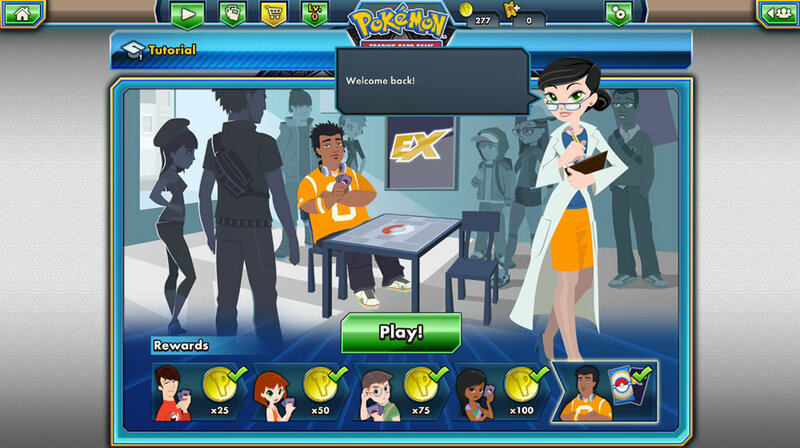 Each day, the player receives 10 extra Trainer Tokens after completing their first Random Battle match of the day, with no consideration to whether they win or lose. 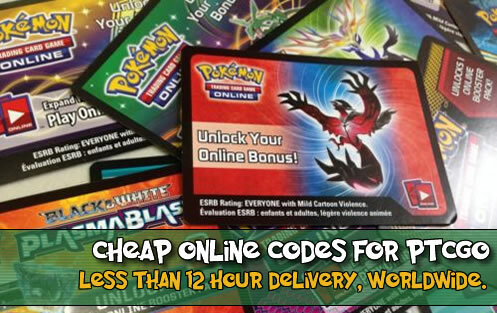 Similarly to other online games, players will earn rewards for logging daily into Pokémon Trading Card Game Online. This features doesn't require the player to login consequently each day. Players may skip a day or two, without logging in, without losing their progress on the login Track Reward System. New players will be put into a 3 days Login Reward System, and will be moved to a 5 days one, once they earn the reward of the third day. The Five Days Reward Track System recycles back to its start, once the player earns the reward of the fifth day. Spinning the Bonus Wheel feature allows the player to test their luck and receive a random reward. There are two types of Bonus Wheels; the Basic Bonus Wheel and the Victor's Bonus Wheel, which gives more rewards than the first type. These Bonus Wheels can be earned through playing Tournament Mode matches or Random Battles within the Versus Mode. The Mystery Boxes are earned through the Bonus Wheels Spin, and they offer different rewards, depending on the Bonus Wheel type they were received from. Some of the rewards are static, while some others change weekly. The Shop features mainly 2 options, one is the Shop itself, and the Redeem Code feature. Here the player can buy avatar items to customize their avatar, Booster Packs, Deck Boxes, Card Sleeves and plenty of other in-game items. Some of the items in the Shop will change on a weekly basis. Players may use Trainer Tokens to buy the wanted items, or they can also use Gems, which is another currency type that can be acquired through real life money, with each Gem equating for 2 Trainer Tokens. Only Adult players are allowed to buy Gems and Event Tickets. 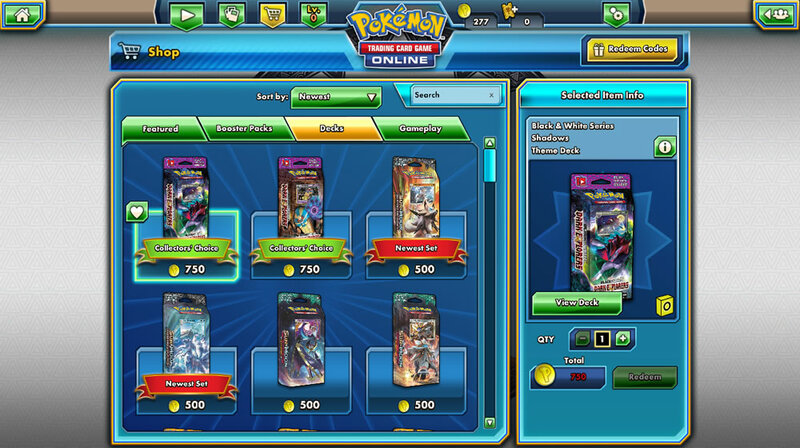 The Trade Feature allows players to trade Cards, Booster Packs and other in game items. This is done through the creation of Private or Public Trade Offers, which can be seen by other players, who will contact the offer poster, if they are interested. Many items, though, are Trade Locked which means they cannot be traded, including many free items acquired easily. The Trade Lock is used to prevent players from having infinite trade options and ruining the in game trade balance. Through the use of the Avatar Creator in the Main Menu, the player can edit their Avatar's Appearance, using many Avatar Items acquired in game or through special events. The Avatar changes include Skin and Hair Colors, Hair and Facial Hair Styles, and a wide range of Apparel and clothing ranging from T-Shirts, Pants, Glasses and much more. Kallie Plagge from IGN liked the game mechanics but was disappointed with the "Unreliable network connections, poor UI, ugly art, and repetitive music", rating the game 6/10, which equates to "Okay" on the IGN Scale. Zac Phoenix from TradingCardGames enjoyed the fresh mechanics of the game and how it didn't turn into a pay to win game, like most of online games, rating it 7.9/10, the equivalent of "Good" on their scale.